We’d love your help. Let us know what’s wrong with this preview of The Last Wolf / Herman by László Krasznahorkai. The Last Wolf features a classic, obsessed Krasznahorkai narrator, a man hired to write (by mistake, by a glitch of fate) the true tale of the last wolf of Extremadura, a barren stretch of Spain. This miserable experience (being mistaken for another, dragged about a cold foreign place, appalled by a species’ end) is narrated— all in a single sentence—as a sad looping tale, The Last Wolf features a classic, obsessed Krasznahorkai narrator, a man hired to write (by mistake, by a glitch of fate) the true tale of the last wolf of Extremadura, a barren stretch of Spain. This miserable experience (being mistaken for another, dragged about a cold foreign place, appalled by a species’ end) is narrated— all in a single sentence—as a sad looping tale, a howl more or less, in a dreary wintry Berlin bar to a patently bored bartender. To ask other readers questions about The Last Wolf / Herman, please sign up. Hunting, being hunted, the collapse of human customs, and a sentence that's 70 pages long. That's Krasznahorkai. I loved The Last Wolf for simple thematic reasons. Because the narrator is a washed-up minor academic and writer who seems to have been offered an interesting piece of work by mistake, but he grabs it anyway, in a way I for one found wholly relatable. Because it's set in Extremadura, the only part of Spain I've ever really found fascinating. (When I did Spanish at school, I wasn't that interested in anywhere else, and I've never felt that you hear enough about Extremadura. But you wouldn't because a lot of it is a rural semi-wilderness.) And because it's fiction about the natural world and its destruction - similar to the sort that Amitav Ghosh and Richard Powers have recently exhorted readers and writers of English-language literary fiction towards, trying to mainstream ideas already established in eco-criticism. But written earlier (2009), in a different literary culture and by an author of this calibre, The Last Wolf follows its own path. It felt right to be reading this over Hallowe'en and the following days of the dead, and as further statistics on the extent of wildlife extinction hit the news. It would have been too heavy-handed as a deliberate choice, but I'd ended up reading it because it was mentioned in a discussion thread I'd looked at while reading Sátántangó, and I was so interested in the topic of The Last Wolf I had to look at it before I'd finished the previous book. The frequency of German place-names in Sátántangó were a reminder that the setting was the territory of the old Austro-Hungarian empire, a larger and more mixed territory than the post-war, Communist, mostly-ethnically-Hungarian Hungary. In the firmly post-Communist Last Wolf, the narrator, free to travel as a European intellectual from an EU country, wanders former Hapsburg lands: a Hungarian on his uppers resident in Berlin, he finds himself summoned over to Spain, and then returns to Germany. The two Herman stories were first published in 1986, a year after Sátántangó: like the novel, they have a dank rural setting, and grapple with characters' dark inner thoughts about their relationship to the world. Part of me always reads any story about gamekeepers, poachers and their techniques through Danny the Champion of the World (by far my favourite Roald Dahl book as a kid - though no-one else's that I ever met - and one of the few books I read so often that my copy looked worn, whilst back then I could read a book twice and still leave it looking brand new). I wasn't expecting to be made to revisit it and that past self now, remembering creeping through the wood with them (how badly I wanted to do that or to be them; sometimes it was my greatest wish! ), hoping bait worked, lost in the process, irrelevant in the moment which side one was on - and having to feel and see that alongside my later, more informed and harder-line opinions about the repeated introduction of an invasive species to just to kill it and generally disrupt the local ecosystem. Herman part I, 'The Game Warden', the tale of a gamekeeper who changes sides, could have been trite in almost any other hands. I wasn't quite convinced this would be something that could have really happened then and there, or occurred to a similar real man, rather than an artist's idea - but the depth of Krasznahorkai's attention to mental processes, and especially his unsentimental relating of them at junctures where most other writers would concentrate on action or cheap crowd-pleasing emotion, elevates it to a level far above obvious poetic justice. He renders the existential and depressive and grubby into some kind of high Gothic, so that one can marvel at the way he describes it and at the baroque darkness of the atmosphere, rather than being dragged down. "the love of animals is the one true love in which one is never disappointed"
imagine if lászló krasznahorkai wrote a single novella-length sentence about a failed, depressed philosophy professor who spends one morning in a german bar recounting the story, to one demonstrably uninterested barkeep, of his trip to spain, the result of an invitation to write a "new chapter" about the extremadura region, which, instead, turns into a compulsion to track down and discover the facts behind the death of the area's last remaining wolf (or wolves), a fated loss internalized by the professor and conveyed in all its dark, existential beauty; but you need not imagine too hard, as the last wolf (el último lobo) is just that, the slim, potent new work by the great hungarian master himself. though released as separate uncorrected proofs, herman and the last wolf will be published as a single hardcover. herman, written in two parts ("herman, the game warden" and "the death of a craft"), are similar in scope to the last wolf, but stand alone as perhaps variations on a theme. "the game warden" is the story of a trapper gone rogue, whose new targets lead the townspeople to take on a terrifying ordeal. "the death of a craft" concerns the very same incidents, but is told from the perspective of the town's visitors. together, these two pieces work to great effect, further revealing krasznahorkai's commitment to intensity and foreboding. and whereas our techniques—having realized in the wake of our sorry experiences that we were not questing heroes but merely dumb victims of the thinking mind—were based on paraphiliac fulfillment, unbridled pursuit of pleasure, the ceaseless apocatastasis of an eden missing from primal imagination, and took refuge in transgression, herman's deliberately paltry means were called into being by hubris, a hubris that believed in the invincibility of weakness. A small book, containing three excellent short stories. Its brevity - and that it feels more like a sampler for ND's upcoming translation of Relations of Grace (which contains at least one of these stories: Herman) - is the main reason I only gave it four stars. This is top-notch Krasznahorkai, in a handsome little (it's quite undersized) hardcover. I just wish there was more is all; it's pricey for the little you get. The Herman stories and Last Wolf were originally published 23 years apart, not originally intended to be read together, and they show strong stylistic differences, but actually they link wonderfully well together as tales of modern development and man encroaching on tradition and nature. Indeed, The Last Wolf is actually available at the Words Without Borders website, (there is now just an excerpt https://www.wordswithoutborders.org/a...), but reading it in the context of Herman (as well as on the written page rather than a screen) strongly enhanced my enjoyment. Overall the book makes an excellent, if not particularly good value for money (120 pages for a 12.99 cover price) introduction to Krasznahorkai, although it is very much a case of start here then read everything he has written. "it was south of the River Duero in 1984 that the last wolf had perished"
The Last Wolf is written in Krasznahorkai's trademark style, comprising one long flowing sentence which drags the reader into the current of the story before dumping them drained but stimulated at the story's end. ...who had written a few unreadable books full of ponderously negative sentences and depressing logic in claustrophobic prose, a series of books in fact, when it had long became obvious, almost immediately obvious, that no one read them of course, and, that being the case, he must long have been washed up as a philosopher, no one was making any serious attempt to understand him or what his sentences, his logic, his diction or prose might be about [...] with his hopeless complex, labyrinthine thoughts and sentences ... the language at his disposal was no longer capable of giving form to subjects that could not be fixed because it had gone full circle, had articulated all it could articulate and had reached the point from which it had started, and was completely exhausted by the circular journey. Out of the blue, he receives an invitation and generous monetary offer from a Foundation in the undeveloped Spanish region of Extremadura to visit the area, the only request being that he writes something, anything, about his impressions. I told him not to tell me, we simply embraced, and that was how I left him, and this brought on the sense of anxiety that I still suffer from to this very day - oh right, anxiety, grinned the barman, yawning and stretching his back still sitting down, muttering to himself in Hungarian, go on then, go tell your story, you last of the wolves, go on, I'm listening - and yes, he replied, turning to face the window, but did not continue, saying nothing more for how could he explain that although he had returned to the place that he had left in order to make a brief trip to Extremadura, what remained for him was a life without thought, in other words the deadly wasteland of the Sparschwein, this cold, empty, hollow square and the fact that he had not earned this or that amount of euros for doing as asked but had instead locked Extremadura in the depths of his old, cold, empty, hollow heart, and that ever since then, day after day, he had been rewriting the end of Jose Miguel's story in his head, and that's exactly where he was now, at the end. The two Herman stories tell accounts of the same story but from very different perspectives. This inexcusable neglect (in Herman's words "the alarming laxity of the authorities") had turned the Remete by the time of the assignment into an unmanageable and impenetrable jungle, a veritable "sore on the well-groomed body of the region""
Here we don't have one single Bernhardian sentence, although the prose is still delightfully complex. But the first version does have the notable stylistic tic of the various phrases in "quotes", giving this the feeling of quotes drawn from a primary source into a secondary re-telling of a local legend, some time after the events. Yet far from depressing him this liberates him as he realises that his distinction between noxious predators and beneficial game was false and that the true issue lies with the human world of which he is part. And he starts to take his revenge by trapping not animals, but the local townspeople. Death of a Craft (second version) gives a very different account of the same events. A group of hedonistic young male officers and women come to a godforsaken small town to visit one of their mothers, a temporary introduction to their quest for paraphilaic fulfilment, unbridled pursuit of pleasure, the ceaseless apocatastasis of an Eden missing from primal imagination. we realised with astonishment that whereas our group - or to use Gusztav's favourite expression: our detachment - as monsters of forward progress was playing the role of pioneers in a world only hesitantly liberating itself from the controlling machinery of goodness, "Herman" had all this while been acting as a fanatic obsessed with the centripetal forces of restraint. We realised that even as we (again only Gusztav managed to find the right words) brutalised things, violating their frail integrity precisely because of their perfection, "Herman", driven by the pressures of ancient ingrained compulsions, managed to monumentalise destructiveness. The details of the two stories differ - in the second the authorities identify Herman sooner, he leaves trapped animals outside people's houses rather than traps for the people, and the ends are very different, again giving the story an air of legend. Indeed in the retrospective account by one of the young officers about"Herman", this in his unique way rather scary fellow, regarding whom to this day it is not entirely certain whether he had in fact really existed or had merely arisen as an embodiment of craven, inferior fears. And the style is extremely different, almost Marquis de Sade, and rather unserious - indeed it is comes with the subtitle contra Yukio Mishima, known for his rather overwrought approach to life. Two excellent novellas about hunting, vanishing crafts, shifting ethics, and species extinction linked by haunting thematic echoes. "The Last Wolf," a single sentence account of a trip to the Spanish hinterlands that's surprisingly addictive, is especially impressive. I'd wager this slim volume is a good introduction to Krasznahorkai. Beautifully designed, too. From the two books I have read of his, Krasznahorkai is a rather frustrating writer. At his best he is very good - an original and unusual voice, original writing style, unusual topics and great insights. At his worst I have found it rather poor ramblings. This book exhibits both. The book is made up of three novellas, although the last two are closely related as they recount the same story from different perspectives - very different perspectives. The first novella, The Last Wolf, is rather good From the two books I have read of his, Krasznahorkai is a rather frustrating writer. At his best he is very good - an original and unusual voice, original writing style, unusual topics and great insights. At his worst I have found it rather poor ramblings. This book exhibits both. Laszlo Krasznahotkai is an artist. The book provoked me, made me uncomfortable at times, made me laugh at others, but most rewardingly, added ways of thinking. He accomplishes this through unusual characters and, in The Last Wolf, his technique. The book in English is a cool presentation in that the first two stories, Herman, and The Death of a Craft, conclude and then you flip the book over and read The Wolf. The first two stories feature a game warden eradicating "noxious beasts" from a small Laszlo Krasznahotkai is an artist. The book provoked me, made me uncomfortable at times, made me laugh at others, but most rewardingly, added ways of thinking. He accomplishes this through unusual characters and, in The Last Wolf, his technique. The book in English is a cool presentation in that the first two stories, Herman, and The Death of a Craft, conclude and then you flip the book over and read The Wolf. The first two stories feature a game warden eradicating "noxious beasts" from a small overgrown forest. He uses traps but at a certain point is overtaken with a change of heart that simply arises, not from conscious thought but from the gut. Reading about a guy who sets traps for animals is, to put it mildly, not my thing. What happens next is a trip, a trip into a Grimm's fairy tale world of contemporary a Hungarian forest. "...that was what was so wonderful about both the land and the people, and that nobody was really aware of the danger presented by the proximity of the world, that they, the Extramadrans, lived in terrible danger because, he explained to the barman, they had no idea what they were letting themselves in for, what spiritual changes would be set in motion once the autopistas and shopping centers had laid havoc to the fields, fields where the poverty had been terrible, because he had seen photographs of what it used to be like and it was dreadful, really dreadful, and one really did half to put a stop to that, and they had put a stop to it, and would continue putting a stop to it, the only dreadful thing being that they had only one way of doing that, and that was by letting the world in, thereby admitting the curse, because everything would be cursed, everything in Extramadura, the land, the people, all, though they had no inkling of it because they lacked the knowledge and had no sense of what they were doing, what they were in for, but he, he did feel it, he pointed to himself, was keenly aware of it and couldn't sleep because of it but lay tossing and turning in the elegant hotel room..."
László Krasznahorkai's The Last Wolf / Herman is a collection of stories around the relationship of humans with a disappearing nature. In "The Last Wolf," we have a 78-page story consisting of a single sentence of a man who travels to Estremadura, Spain, to write on a local topic of his own choosing. He chooses to write about the shooting of the last wolf in the province, but finds it is by no means easy to get to the bottom of the story. "Herman" consists of two substories around the main theme László Krasznahorkai's The Last Wolf / Herman is a collection of stories around the relationship of humans with a disappearing nature. In "The Last Wolf," we have a 78-page story consisting of a single sentence of a man who travels to Estremadura, Spain, to write on a local topic of his own choosing. He chooses to write about the shooting of the last wolf in the province, but finds it is by no means easy to get to the bottom of the story. "Herman" consists of two substories around the main theme of a game warden who is asked to clear a forest that has run wild of all the predators that have sought it as a refuge. In the first version, "The Game Warden," the warden becomes disgusted with his success and takes it out on the townspeople, who come for him with guns. "The Death of a Craft" is the same story up to a point, though as seen from a group of libertines, male and female, who have come because the mother of one of them is dying. The warden has started setting non-fatal (but harmful) mantraps around the village, but comes to see the error of his ways. "The Last Wolf" is a novella, 76 pages in translation, written in what is usually described as one of Krasznahorkai's characteristic long sentences. Technically, that isn't right, because the novella is actually a string of run-on sentences, with ordinary sentences embedded in them. Grammatically correct long sentences are rare in fiction. (See the remarks on Enard's "The Zone.") This form is looser and, I think, less interesting than a single long sentence (as in Raymond Roussel's "New Impressions of Africa") or a genuine analocuthon (as in late Thomas Bernhard). In the novella, a philosopher sits at a bar and recounts a trip he made to Extremadura, Spain, and to Alburquerque, the near-namesake of the city in New Mexico. The philosopher was invited to Spain in order to write about anything he might choose, and he ends up investigating the shootings of the last eight wolves in the region, in the 1980s and 1990s. He is given an unlimited budget and a translator, and he's driven around so he can interview people. All along he keeps saying, to the bartender, that he has said everything he can, that his thinking life is over, that even accepting the invitation was a sham, that he cannot write anything. In the end the killings of the last two wolves coincide with the end of his story, and -- as a reader will have surmised from the first couple of pages -- he ends up back in the bar, without having written anything. It's all a common literary conceit: the unwritten text, the unspoken account, actually told, but not to an attentive hearer, or one who will retell the story, or write it down. (The bartender is represented, implausibly, as sometimes falling asleep.) The last of the wolves is the last of his thoughts; his wandering in Extremadura is his meandering mind made real, and so forth. The story is simply not ambitious enough. If Krasznahorkai had more energy or commitment, he would have explained why it isn't a paradox that the philosopher actually has told a story, and in fact it's the story we're reading. The philosopher didn't write it down, but the author did. How, in the logic of the novella, does a person supposedly at the end of this thinking life manage to write -- really, to toss off -- a seventy-page novella? Of course there are thoughts in his head: we know, because we read them page after page. To make this more ambitious, more consistent, and more challenging, Krasznahorkai could have written out the philosopher's incapacity on the page, showing us what it was like for the to be unable to think. The philosopher chooses to investigate the killing of the wolves because he remembers reading something about it, and in fact he made a note of it. That is interesting, but it isn't explained: but in a deeper version of this story, we could be told that he is perplexed by his choice of that article, and curious about his own interests and motives in finding it. That could be a sign of his ongoing inability to sort out his own motivations and thoughts. And while he is on the pursuit, he could do more than simply record what he sees and hears: he could wonder if he is being coherent in his intentions, or faithful to whatever remnants of intentions he may have. By his own account, after all he can no longer think philosophically: but we're never told what that means, exactly, and what could it mean other than an incapacity for rational thought? And how could such an incapacity not vex or even torture the person who thinks he suffers from it? And how could he not wonder, at every moment, what he is understanding and what he isn't? Me pone tan feliz haber leído a Laszlo. Es como descubrir una joya escondida: mientras se lee, uno tiene la impresión de haber encontrado a un nuevo clásico de la literatura universal. "Herman" (un cuento contado desde dos diferentes perspectivas) y "El último lobo" (una novela corta) son dos historias muy distintas pero que se complementan a la perfección. En cualquier orden que se les lea (ya que, dada su forma de impresión, el libro te permite escoger qué relato vas a leer primero) ambas histo Me pone tan feliz haber leído a Laszlo. Es como descubrir una joya escondida: mientras se lee, uno tiene la impresión de haber encontrado a un nuevo clásico de la literatura universal. "Herman" (un cuento contado desde dos diferentes perspectivas) y "El último lobo" (una novela corta) son dos historias muy distintas pero que se complementan a la perfección. En cualquier orden que se les lea (ya que, dada su forma de impresión, el libro te permite escoger qué relato vas a leer primero) ambas historias parecen ocurrir en el mismo universo: el de la feralidad sagrada, en una naturaleza tan hostil como bella, misma en la que ya no cabemos como seres humanos. Ambas historias tratan de lo mismo: gente que se encuentra de sopetón con la muerte, con esa parte inconsciente de su ser a la que sólo puede llegarse a través de la epifanía. I love long sentences so part of me was primed to love this kind of thing. Both novellas are pretty different, offering very different experiences, but also working together in an interesting way. But, yeah, really more for those interested in style. The Last Wolf is a 70 page sentence, which is full of self-loathing and digressions, and an interesting story about a man who hunted wolves. Herman is a bit stranger and darker, about a man inflicting random violence upon a small town. Good stuff. I I love long sentences so part of me was primed to love this kind of thing. Both novellas are pretty different, offering very different experiences, but also working together in an interesting way. So far, I have found Krasznahorkai’s work I've read to be fascinating, though not necessarily enjoyable. The Last Wolf & Herman are no exceptions to this, despite being quite short. Make no mistake, though the New Directions edition is over a hundred pages, that's thanks to small pages and wide margins, so in truth there are perhaps only about fifty regular pages-worth of content here. 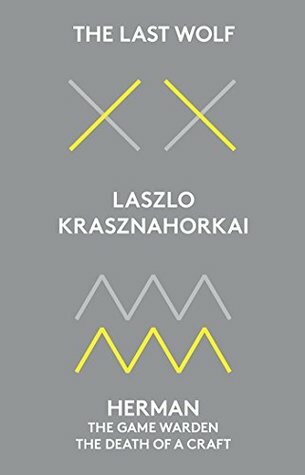 Of those fifty pages, more than half are taken up by The Last Wolf, a story that consists of a single sente So far, I have found Krasznahorkai’s work I've read to be fascinating, though not necessarily enjoyable. The Last Wolf & Herman are no exceptions to this, despite being quite short. Make no mistake, though the New Directions edition is over a hundred pages, that's thanks to small pages and wide margins, so in truth there are perhaps only about fifty regular pages-worth of content here. Of those fifty pages, more than half are taken up by The Last Wolf, a story that consists of a single sentence, epitomizing a style Krasznahorkai has used before in War & War and Seiobo There Below. The rest of this slim volume is a pair of linked stories under the umbrella title of Herman, and titled The Game Warden and The Death of a Craft individually. Thematically, The Last Wolf links with The Game Warden, showing the other side of a thematic coin. The Game Warden and The Death of a Craft share the same setting (as far as the reader can tell), but I found the connection between them less interesting. The Death of a Craft was my least favorite of the lot, The Game Warden my favorite, and The Last Wolf the one that gave me the most to think about. This small book consists of three short stories. Two of them are alternative accounts of the story of Herman, a gamekeeper beset with guilt over the number of animals that he has killed, and the extreme actions he takes as a result. The first of them. "The Game Warden", is quite good, but the second, "The Death of a Craft", is pretty silly and poorly resolved. The main story is "The Last Wolf", wherein a minor academic regales a bored and testy Hungarian barman with a long and convoluted tale abo This small book consists of three short stories. Two of them are alternative accounts of the story of Herman, a gamekeeper beset with guilt over the number of animals that he has killed, and the extreme actions he takes as a result. The first of them. "The Game Warden", is quite good, but the second, "The Death of a Craft", is pretty silly and poorly resolved. The main story is "The Last Wolf", wherein a minor academic regales a bored and testy Hungarian barman with a long and convoluted tale about how he went to Spain and tracked down the man who shot the last wolf in the region. This story is notable for being told in a single 70-page sentence. The story is not that interesting (intentionally) but the character of the barman gives sporadic amusement. Excellent stuff: Herman is a memorable narrative, The Last Wolf is a memorable sentence. Can't ask for much more, especially with the cute design. It was the first of these stories that appealed to me and made me seek the book out, and yet it was the other two that I appreciated most. In The Last Wolf a Hungarian bartender in Berlin hears a story from an old philosopher and on the spur of the moment travels to Extremadura where he is led to believe, the last wolf perished in 1983. On arrival though, he soon realises that the story he heard didn’t travel well, and there’s far more to it. It’s a strange but compelling story of displacement It was the first of these stories that appealed to me and made me seek the book out, and yet it was the other two that I appreciated most. In The Last Wolf a Hungarian bartender in Berlin hears a story from an old philosopher and on the spur of the moment travels to Extremadura where he is led to believe, the last wolf perished in 1983. On arrival though, he soon realises that the story he heard didn’t travel well, and there’s far more to it. It’s a strange but compelling story of displacement and interpretation, that is told in just one 74 page sentence. The other novella, Herman , is told in two chapters that tell of the same incident from differing perspectives. A game warden, after many years of hunting and trapping what he believes to be predatory animals, has a nightmare vision and finds he cannot carry on, and instead traps those who hunt the animals. "The Last Wolf" is a single-sentence story and your mileage on that one will vary depending on... well, how you feel about single-sentence stories. For me, they're often intriguing but they will ultimately send my mind wandering elsewhere while reading (that sort of stream of consciousness thing will do that; too close to my own neural pathways, I suppose). That's basically how I felt about "The Last Wolf" although I appreciated the Aira-esque qualities of that particular tale. "Herman" on the ot "The Last Wolf" is a single-sentence story and your mileage on that one will vary depending on... well, how you feel about single-sentence stories. For me, they're often intriguing but they will ultimately send my mind wandering elsewhere while reading (that sort of stream of consciousness thing will do that; too close to my own neural pathways, I suppose). That's basically how I felt about "The Last Wolf" although I appreciated the Aira-esque qualities of that particular tale. Three tales – one a single 70-page sentence, an extended breath that leaps from embittered melancholy to comic travelogue and an unexpected epiphany of grief. I've had a couple novels by Krasznahorkai tucked away for years, unread. This I picked up for its clever cover and format (once you've read the first story, you have to flip the book over to read the other two). From the first page I was afraid I was reading Thomas Bernhard, but on a foggy Sunday night in San Francisco how I could resist a Three tales – one a single 70-page sentence, an extended breath that leaps from embittered melancholy to comic travelogue and an unexpected epiphany of grief. I've had a couple novels by Krasznahorkai tucked away for years, unread. This I picked up for its clever cover and format (once you've read the first story, you have to flip the book over to read the other two). From the first page I was afraid I was reading Thomas Bernhard, but on a foggy Sunday night in San Francisco how I could resist a story that begins "There he was, laughing, but in trying to laugh in a more abandoned manner he had become preoccupied with the question of whether there was any difference at all between the burden of futility on the one hand and the burden of scorn on the other…"? I ask myself the same question almost every Sunday night. So far, I have found every Krasznahorkai work I've read to be fascinating, though not necessarily enjoyable. The Last Wolf & Herman are no exceptions to this, despite being quite short. Make no mistake, though the New Directions edition is over a hundred pages, that's thanks to small pages and wide margins, so in truth there are perhaps only about fifty regular pages-worth of content here. Of those fifty pages, more than half are taken up by The Last Wolf, a story that consists of a single s So far, I have found every Krasznahorkai work I've read to be fascinating, though not necessarily enjoyable. The Last Wolf & Herman are no exceptions to this, despite being quite short. Make no mistake, though the New Directions edition is over a hundred pages, that's thanks to small pages and wide margins, so in truth there are perhaps only about fifty regular pages-worth of content here. Of those fifty pages, more than half are taken up by The Last Wolf, a story that consists of a single sentence, epitomizing a style Krasznahorkai has used before in War & War and Seiobo There Below. The rest of this slim volume is a pair of linked stories under the umbrella title of Herman, and titled The Game Warden and The Death of a Craft individually. Thematically, The Last Wolf links with The Game Warden, showing the other side of a thematic coin. The Game Warden and The Death of a Craft share the same setting (as far as the reader can tell), but I found the connection between them less interesting. The Death of a Craft was my least favorite of the lot, The Game Warden my favorite, and The Last Wolf the one that gave me the most to think about. With The Last Wolf, I've now read enough of Krasznahorkai's work written in the long sentence format that I'm left to assume that he's not just interested in the format stylistically, but that he's trying to represent something through the lack of periods. Reading War & War, I thought that Krasznahorkai had written in that style to reflect the mental state of the main character, and, while I think it does capture that mental state, I now think that I was simplifying what Krasznahorkai was getting at. Here, I found myself also thinking of the narrator of The Last Wolf as slightly unhinged because of the style the story was written in, with one statement flowing into the next and never pausing, but at the end of the story I could point to little to suggest that the narrator was actually unbalanced. Instead it was the way in which I read the style of the story that suggested it, which was likely due to my own assumptions more so than the book. My new theory is that Krasznahorkai writes in this style because he believes it best reflects the actual nature of how we experience the world. Besides death, there are few times when a person's thoughts fully stop, with sleep just transitioning conscious thought into unconscious thought. Thus, one thing does flow into another for us, until our story is done. The Last Wolf depicts a man telling a story at a bar about a trip he took to Extremadura and what he heard about wolves there, and all elements of that experience, the setting of the bar, the asides to the bartender, the substance of the story, are all part of a single experience, and so Krasznahorkai captures that experience in a single sentence, without the unnatural pauses created by periods. For my part I don't agree with this philosophy, but who's to say my thesis is in any way close to the truth? I'll revise it as necessary as more works by Krasznahorkai become available in English. The Game Warden is written in a traditional format, and presents the story of a man confronting himself with the horrors of being a hunter, and his efforts (likely misguided, as he himself recognizes) to put his realigned worldview into practice. The theme here contrasts nicely with the nobility of the hunted portrayed in the closing pages of The Last Wolf. This was my favorite of the stories, likely in part because it is the most traditional. What can I say, I like a story with a beginning, middle, and end, where the actions of the main character is central to the story, written in a way I don't find distracting. It helps that Herman's breakdown, and the actions he takes thereafter, are so evocative. I want to note, however, that even though this was my favorite, it didn't floor me and it didn't compare to Krasznahorkai's best long works. The Death of a Craft is my least favorite, hinting at things instead of telling them, creating a bit of a mystery but never giving a reader motivation to solve it, where the most consequential actions are those the characters are only told about and never shown, never take an active role in. Also, hedonism and the destruction of conventional morality have always been such a lazy philosophy to base characters around, every attempt to shock just makes them more boring. Very odd, not my taste. A few short stories told in one long, run on sentence. More of a philosophy book told through a story, like The Alchemist or Old Man and the Sea. Hard to stay focused because it's told in a 70 page long sentence. Impressive, but also very forced. What a wonderful place to start for non converts to Krasznahorkai, although the two (Herman is split into two takes) stories 'The Last Wolf' & 'Herman' were originally published 23 years apart!!! Fans will love to dip into his world again, newbies can get a taste before they'll be hooked. This is actually the first book I've read by Krasznahorkai, and it certainly won't be the last. 70 page sentences might be challenging but they're well worth the effort. One of the masters of world literature. An intriguing introduction to a writer I am now very eager to read more of. This short work packs a hell of a punch. Exceptional work! Word of warning: don't read if you don't like reading about bad things being done to animals!!! Either the emperor doesn’t have any clothes or I’m just not enough of an intellectual to enjoy this type of thing. Meh. Yawn.